in which part of the world we dwell, we are one. We are one with each other. We are one with the Earth. We are one with the moon, the sun, and the stars. The African White Lions are regarded as animals from the last ice age and their white color is considered testimony of those conditions. One traditional explanation given to the White Lion’s stature stems from when, it is described, all of humanity suffered from disease and famine and the “anger of Mother Nature.” During those desperate times, tradition teaches, the people prayed all night and day. In response, the gods sent down the White Lions to teach the people how to survive, how to hunt, how to keep warm in the bitter, wild cold. Their mission of helping humankind during profound Earth changes is shared with Bear and the other White Spirit Animals. Native legends recount that the White Spirit Lions, after helping the impoverished and stricken humanity overcome their adversities, left, promising only to return when humankind is in danger once again. And so they have returned. 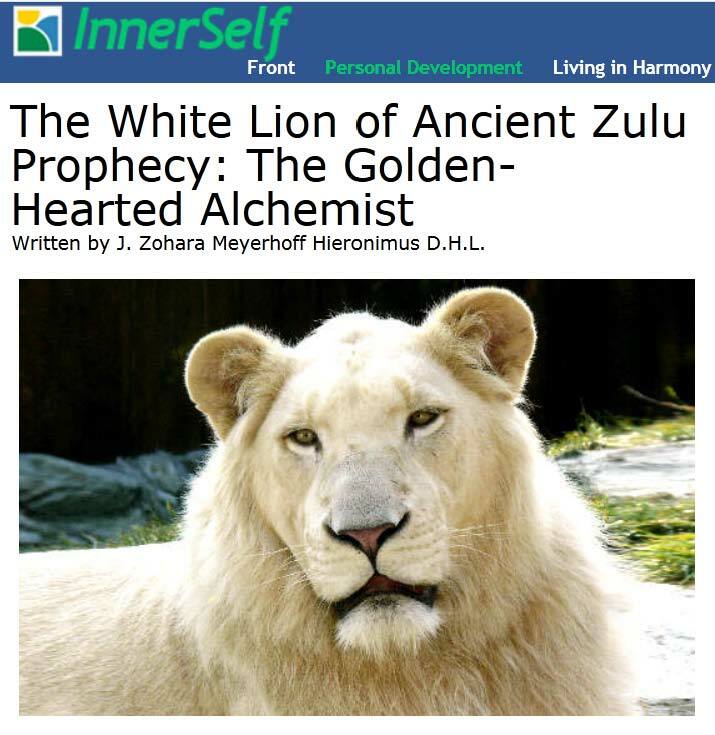 First observed in the 1930s and 1940s, and later in 1975, the White Lions’ reappearance in the twentieth century affirms ancient Zulu prophecy. Conservation means taking responsibility worldwide and enacting practices in each locale that show love and compassion for all life. It was prophesized that the White Lions would return when humanity was on the verge of disaster. Apparently, now is that time. Heart intelligence can help us transform past destructive practices into approaches that sustain and elevate life. The Lion Guardians organization, founded in 2007 by Leela Hazzah and Stephanie Dolrenry, is an important example of transformation in Africa. The Maasai of East Africa live in present-day Kenya and northern Tanzania. For centuries, they have hunted lions as part of their initiation into manhood. The Lion’s imminent extinction has not stopped these rituals. But Lion Guardians offers an alternative manhood initiation by emulating another Lion quality, that of protector. The Maasai live a mostly pastoral life and depend on their livestock to feed their families. If they lose any of their livestock to lions, or believe that it was from lions, they retaliate by killing lions. Lion Guardians helps return lost livestock, rebuilds animal fencing, tracks lions, and notifies herders when Lions are near, enabling them to take different routes. They employ sixty-five Lion Guardians throughout East Africa, who are paid the equivalent of $100 a month, taught to read and write, and tasked with tracking, naming, and knowing the whereabouts of the Lions they protect. Their ultimate goal is to prevent any conflict with Lions and to reduce Lion killings, increasing their now dangerously small populations. In the past fifty years Africa has lost 50 percent of its Lion population. But in Amboseli, Kenya, the Lion Guardians have documented a near tripling of the Lion population since beginning their work. Here we see that an ethos of care rather than exploitation and destruction can change a death economy to a life-elevating economy, enlisting members of local communities to reshape and redefine their relationship to their own environment and its populations, human and animal. As the symbolic alchemist, Lion reminds us that protecting the Earth is our noble-hearted purpose. Read the article online at InnerSelf.